Currently Vice President and a Life Member of the Firemen's Relief Association. 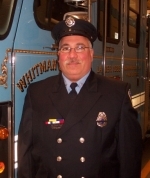 Current Positions: Firefighter, Trustee and Life Member of the Whitman Square Fire Company and Vice President of the Washington Township Relief Association. Former Positions: President and Vice President of Whitman Square, President of the Washington Township Relief Association and Fire Commissioner in Washington Township.